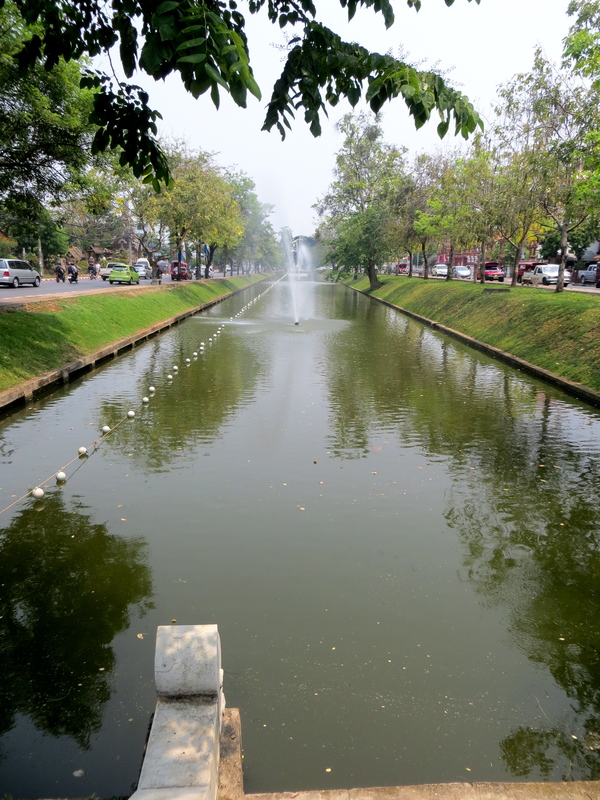 Following our disastrous day of travel to Bangkok, I decided to splurge on flights to and fro the charming northern city of Chiang Mai (pronounced “Chang My”), one of my last stops in Thailand. Coming here, I expected a quiet, lush mountain town, but instead found a large, modern city. 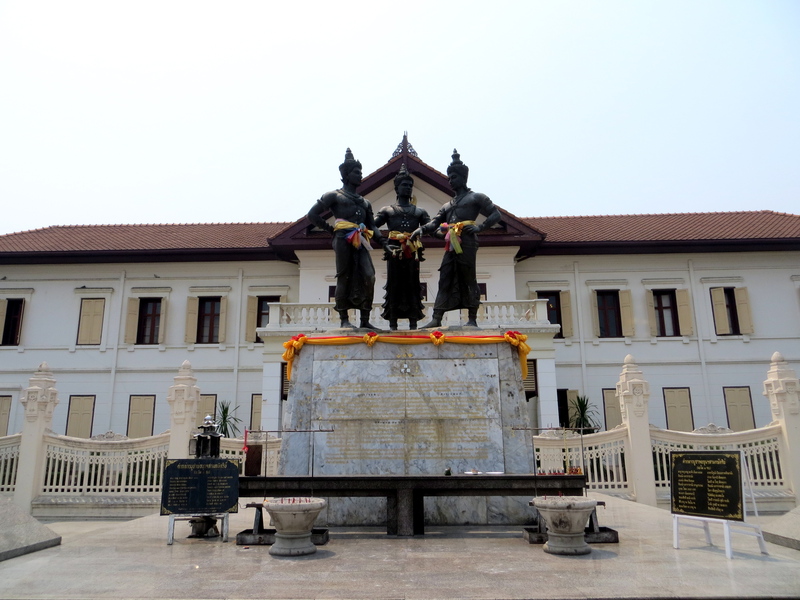 What makes Chiang Mai a welcome change from Bangkok though is the amount of history, culture and peacefulness surrounding this place. 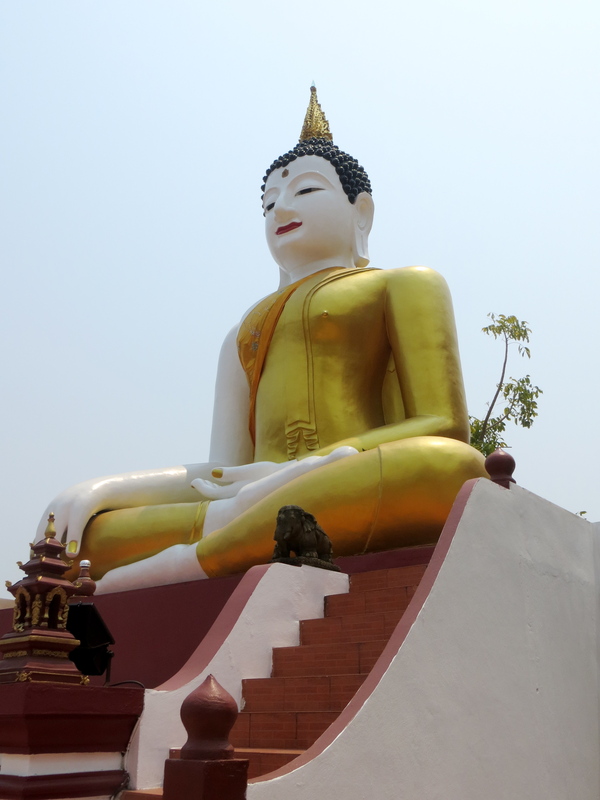 Northern Thailand is known for its beautiful temples, flora and fauna, food and trekking. While I didn’t have time to fit in a trek, I did take advantage of as much as possible. 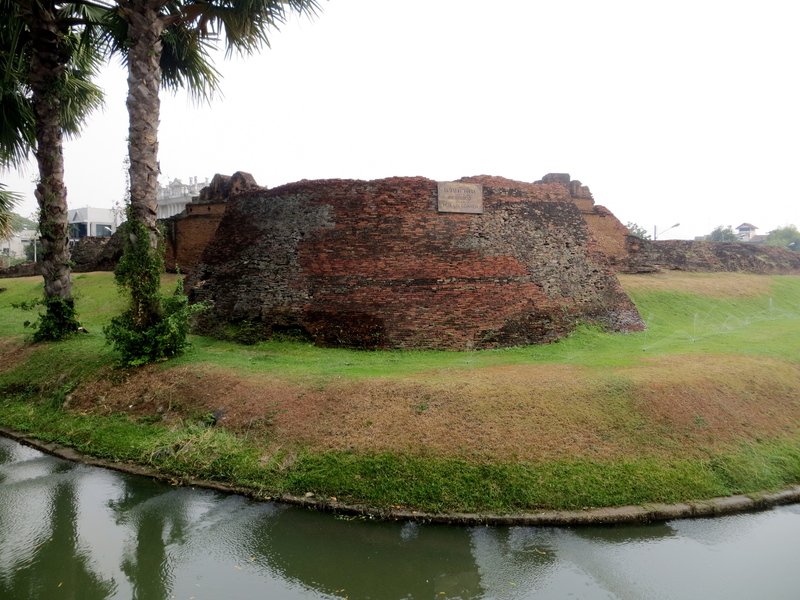 The amount of temples (wats) found inside the historic old square city walls (actual stone corners still remain), is amazing. My first day here was spent wandering the city, popping in and out of these intricate places of worship. By the end of my hot walk in the sun (be prepared to sweat if you come during hot season like I did), the wats started to blur together. Regardless, I really enjoyed the monk spottings in taxis and on the streets, as well as the many unique golden shrines on almost every block. 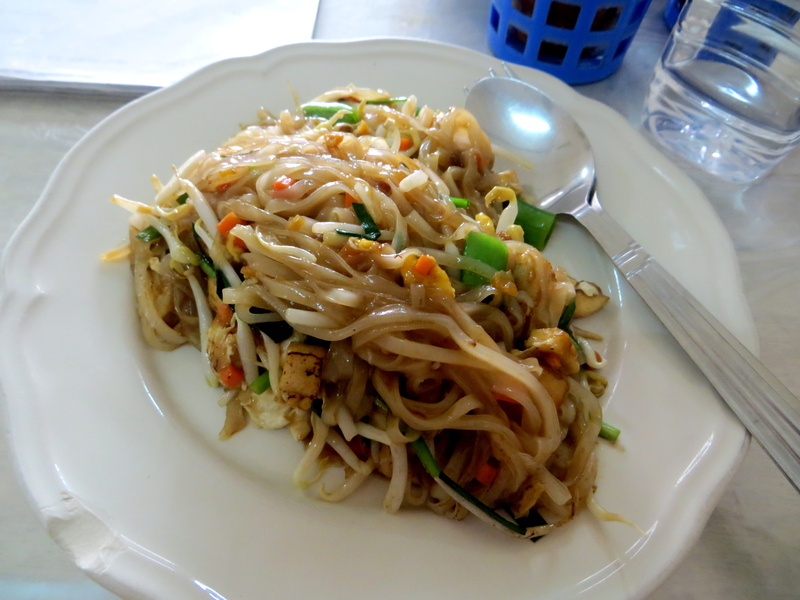 Since arriving in Thailand, I’ve made a point to try pad thai (one of my favorite dishes) every chance I got. During my Chiang Mai wander, I by chance stopped at a tiny, crowded restaurant off the Walking Street (dirt road that allows motor bikes and tuk tuks, even though it’s meant for ‘walking’). After a month of trying new pad thais almost everyday, I finally found the best – precisely cooked noodles with a well blended tangy and spicy sauce and the perfect amount of tofu, vegetables and peanuts. And if you can believe it, this deliciousness only cost 30 baht ($1)! 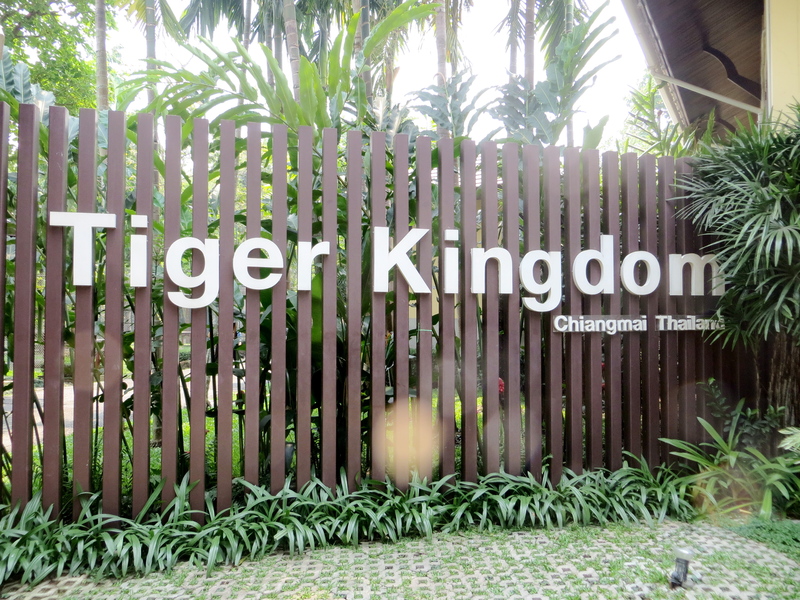 Only in Thailand would you find a thriving tiger petting zoo. Clearly, I had to experience this. I joined a group from my hostel and we set out nervously to the reserve 30 minutes outside the city. Once at tiger town, we felt like we were walking into an amusement park – zorbing available on the nearby lake, tons of souvenirs and a nice restaurant overlooking the roaming tigers. 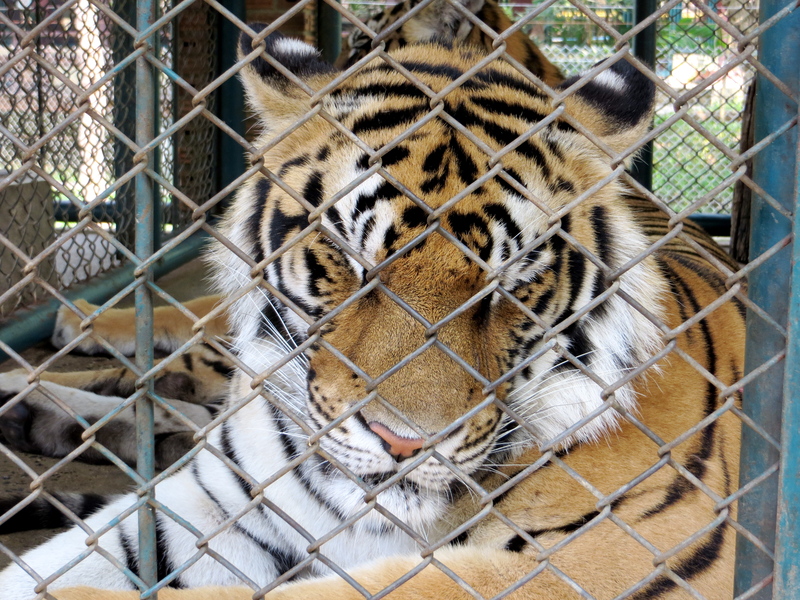 After washing our hands and slipping on some tiger-friendly flip flops (kind of like bowling shoes, except less sanitary), we walked into the cage of cubs. 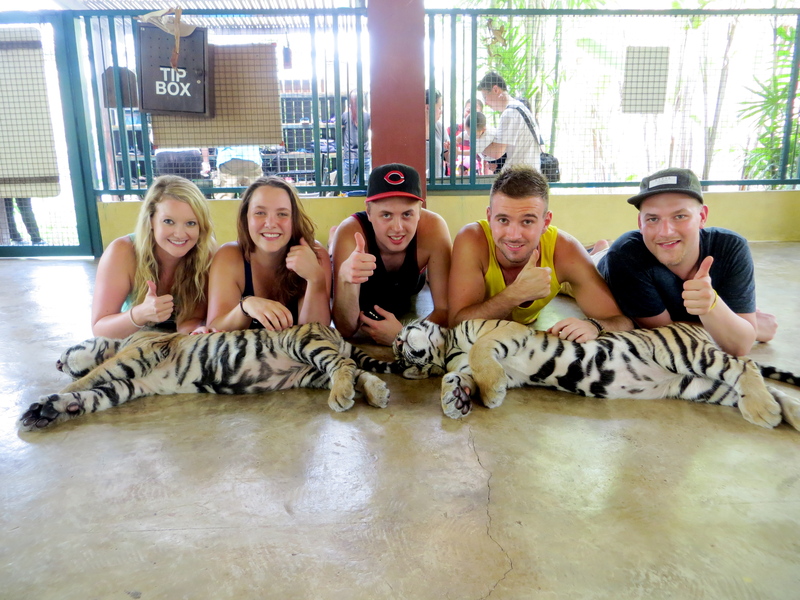 There were about eight tourists, three guides and 10 baby tigers. Sure they were ‘small,’ but they still had full claw swatting and biting capabilities. Danger aside, these cubs were beyond adorable. Our next stop was the full sized tigers. These cats were enormous! Since zoos in America keep the animals at a safe, fenced in distance from people, I’ve never seen a tiger up close. Here, there’s literally a normal backyard fence between you and the 50-odd tigers at this park. 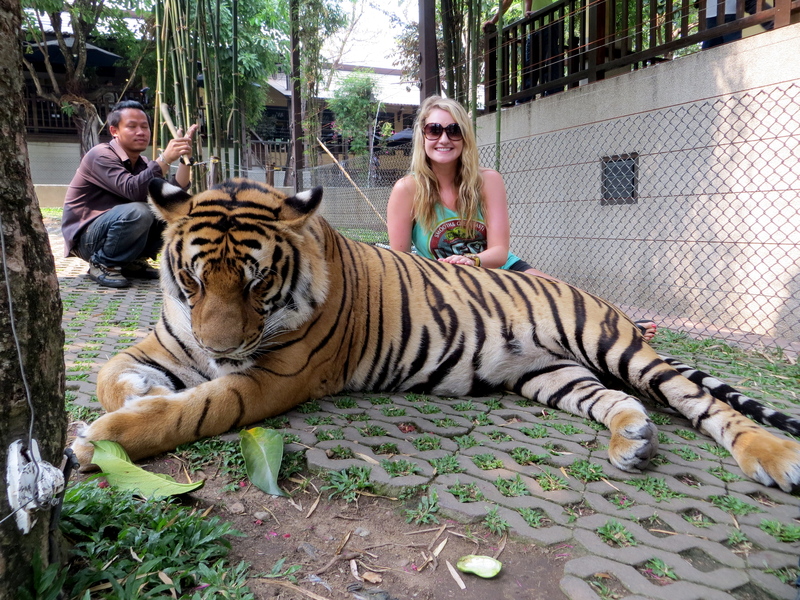 When our group was called for our time with the “Big Cats,” I almost chickened out. But, since I didn’t see any human attacks during our 10 minute wait, I figured (hoped) we’d survive. Once inside the cage, we found ourselves face to face with four massive unchained, non-drugged tigers. For each group, there was one guide. His form of defense should something go awry, a wooden stick. It’s clear these tigers are healthy (although pretty overfed), well-trained and mostly asleep, but you can’t help but panic a bit while petting a natural predator. The Thai guides with their wimpy sticks don’t provide much reassurance during your equally terrifying and thrilling tiger encounter. This was a once in a lifetime experience and I’m so glad I mustered the nerves to enter the cages. It was simply amazing to interact with tigers (without having to become a zoo keeper or magician). 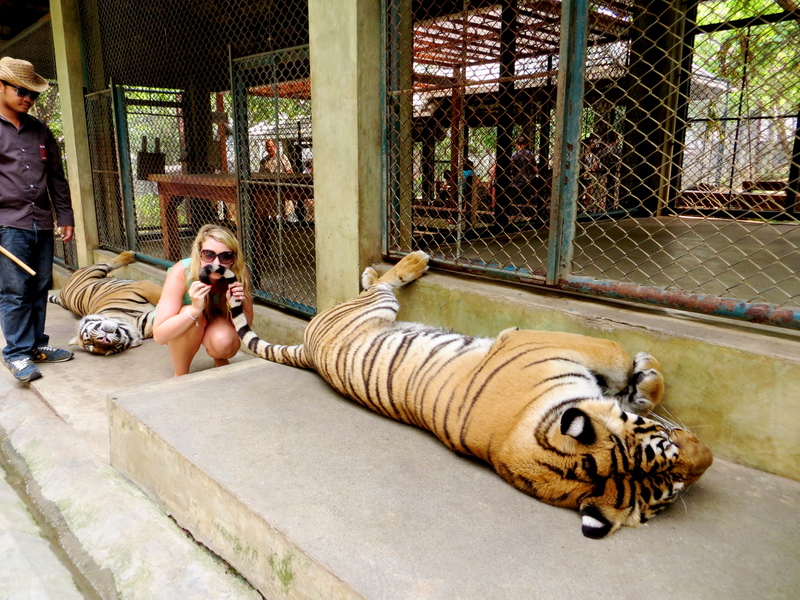 The best remedy for a nerve wracking day of playing with tigers is definitely a traditional Thai massage. 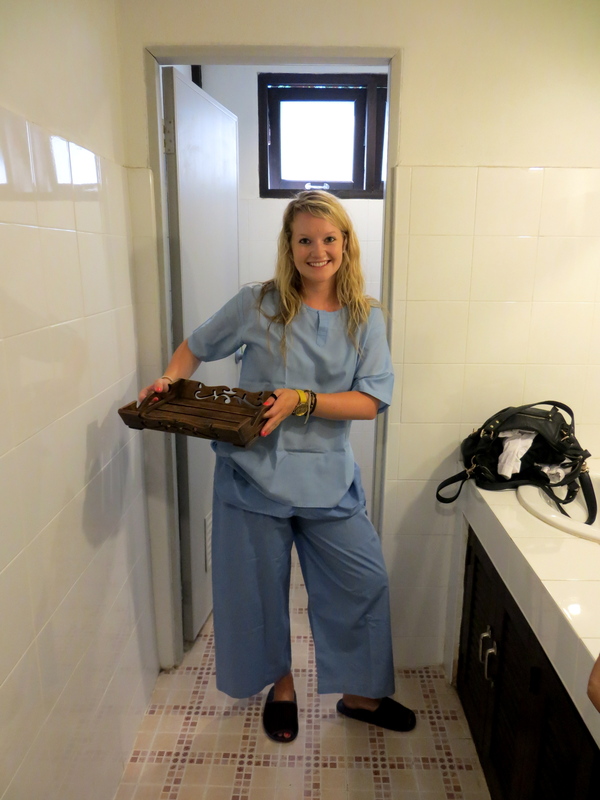 While living on the edge, why not get said massage at a local prison? 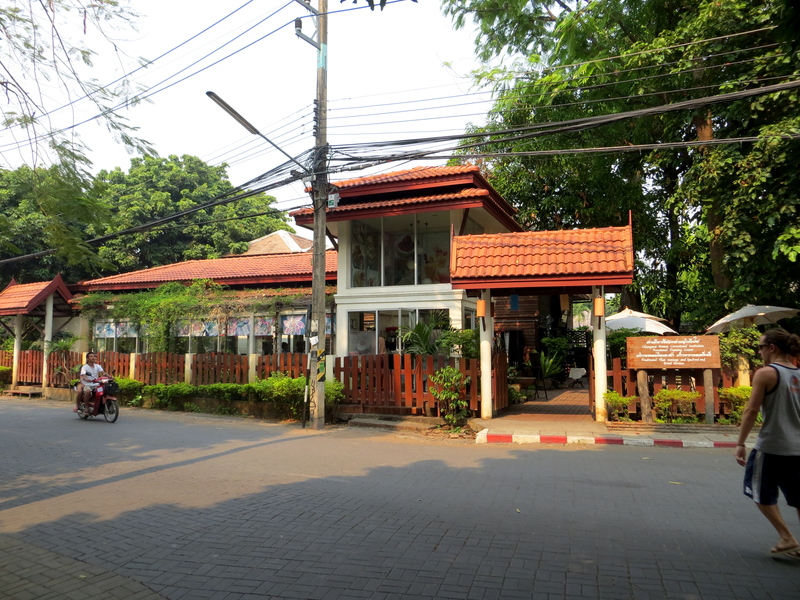 Don’t worry, the Chiang Mai Women’s Correctional Institute is nothing like the Thai prison in Brokedown Palace. Rather, it’s a friendly place with a beautiful, relaxing atmosphere. You are greeted by a guard, but the entire experience once inside is like what you’d have at any spa, except your masseuse is an inmate (about to be released for minor offenses). We were given interesting robes to wear, and then were stretched, cracked and bended for the next hour. I find Thai massages similar to deep tissue massages – while sometimes painful, you do feel amazing afterwards. Six dollars for a full body massage? I’m going to miss Thailand. Chiang Mai is also a great hub for trekking. On treks, you’re taken elephant riding, bamboo rafting, white water rafting (in the wet season), hiking through the jungle and to spend time with the Hill Tribes People. Everyone I met that went on a trek had an unbelievable time, and I really wish I had time to experience one of these tours, but I can always come back! 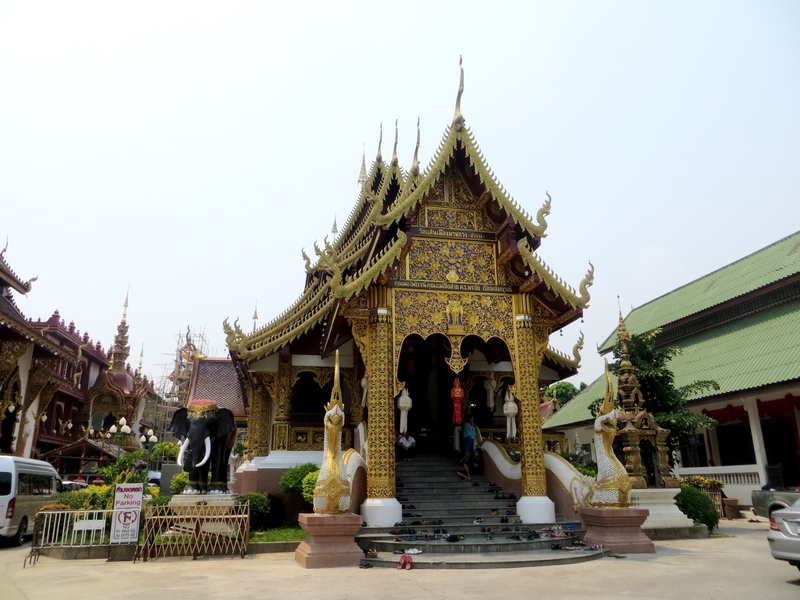 Posted on April 9, 2013, in Backpacking, food, Southeast Asia, Thailand, Travel and tagged Backpacking, Chiang Mai, Pad Thai, Temples, Thai Massage, Thailand, Tiger Kingdom, Tigers. Bookmark the permalink. 1 Comment. 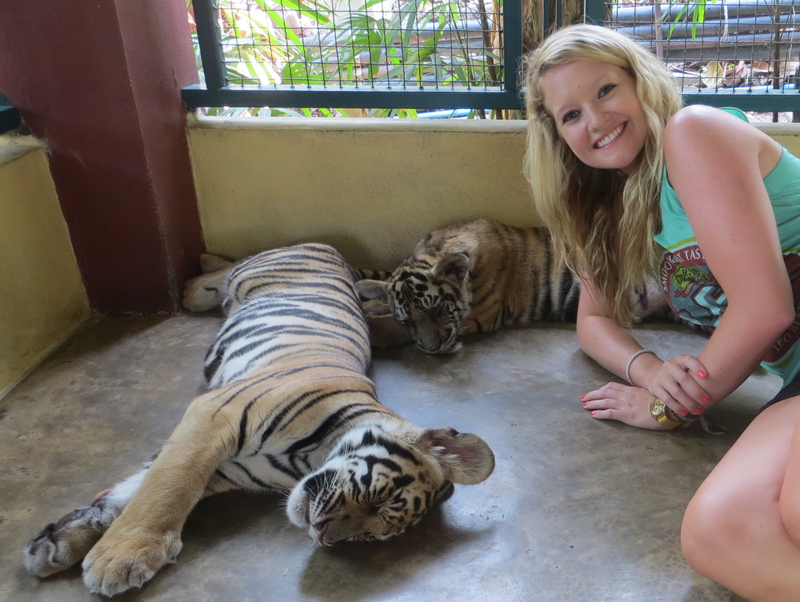 I love the picture of you with the tiger cubs. Pure joy!